A baking classic! I love to have this little handy recipe with me ready for those unexpected guests when you need to whip up an easy dish with a fresh salad! Mum used to always have the ingredients in the fridge for a classic quiche lorraine and it served her well when all those friends my brother and I had who used to drop in, hungry and looking longingly at my mother's kitchen!! You can substitute the bacon in this dish with spinach and mushrooms for a great vegetarian filling. Stir together flour and salt. Cut the butter into the flour mixture until it resembles coarse breadcrumbs. With a fork or a pastry blender mix the until it becomes a dough. Sprinkle cold water over flour mixture, 1 tablespoon at a time, tossing gently with fork until moistened. The dough should be stiff but not crumbly. If too much water is used, the pastry will be tough and may shrink; too little water and the pastry will be to crumbly to roll. Once all flour is moistened, form dough into a ball with the fork. Turn out onto a lightly floured surface. Flatten dough into a pancake shape and smooth edges with hands. Roll the dough from centre to edges with light, even strokes, forming a circle of 25cm in diameter and about 3mm thick. Reshape edges into a circle with your hands as you work. 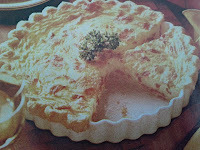 For easy transfer to the quiche baking dish wrap pastry around rolling pin carefully so that it does not stretch. Then loosely unroll pastry onto an 18 or 20cm quiche dish. To repair any tears, moisten edges with a little water and press together. Ease the pastry into the dish, being careful to avoid stretching the pastry. Stretched pastry shrinks when baked. Use kitchen shears or a sharp knife to trim the edge of the pastry 1 to 2.5cm beyond the edge of the dish. Fold extra pastry under to build up the edge. Line the pastry with foil or baking paper and fill it with dry beans to ensure that the pastry does not puff up or shrink during baking. Bake the pastry at 230degrees for 5 minutes. Remove beans and foil/paper. Set pastry aside and; reduce oven temperature to 160degrees. Cook bacon until crisp; drain and crumble. Reserve 1 tablespoon bacon; sprinkle remaining into partially baked pastry. Top with cheese. Combine flour, remaining sale and nutmeg in large measuring jug, stir in milk and eggs. Carefully pour over filling in pastry. Bale for 30mins. Sprinkle with reserved bacon; continue baking until a knife inserted near centre comes out clean. After taking it out of the oven, let it stand for 10mins before serving. Cocinar, comer y ser feliz. My favourite quiche. Yours look so elegant. Thanks so much Veronica Ng, so lovely to hear from you. 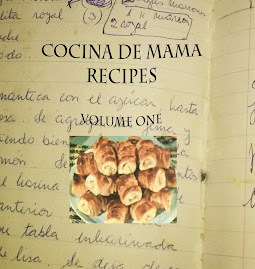 Cocina de Mama on YouTube!